hey jen renee: cool, cool. 1. Tonight I spent some quality time with my girls. And acheived a goal I've had for years. My pals Amy and Sarah took turns teaching me to do a couple of simple knit stitches and I coudn't be more stoked. I'm prematurely starting a little chunky scarf but it will be a good practice project. 2. Check this out. It is basically my dream come true. My girl Shimelle is making fabulous screen-prints of my Christmas scrapbooking tags! She has printed them on cardstock and vintage dictionary pages - be still my heart. Really. I can barely contain myself. 3. Lotus is famous. She is featured on the GabbaFriends site! 4. And just when it couldn't get any more exciting, guess what? This month I'm the Guest Mojo Girl at ScrapMojo. I was thrilled to get an email from the totally inspiring Marie - I've got much love for that site - it's an honor. My interview is up right now if you want to take a peek. Check back Friday @ Mojo for the brand spanking new challenge and scrappage from moi! you go jen! I'm still learning too... and finding it harder than crochet, but I'm not giving up! Congrats on guest mojo girl!!! I want to learn how to knit too...and quilt and....I want to do it all!! haha! 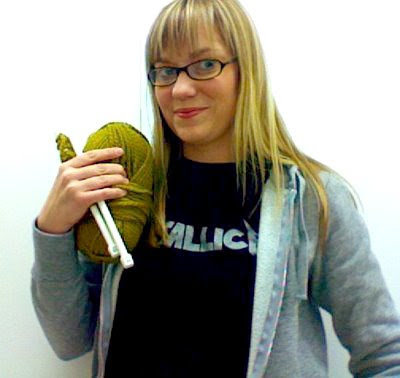 YAY you got started on learning to knit!! GO YOU!! It gets addicting and theraputic(sp?) Anyway, I should pick up my knitting again. and i can't wait for the next work-your-soul! thats so cool you're learning to knit. its on my to do list. Congrats on Scrapmojo,,, so much fun. YAY for all the good things going on for you!! Congrats on Mojo! And Shimelle's projects look cool! Can't wait to see your chunky scarf!